This hasn’t been a banner year, has it? There hasn’t been much to celebrate in world or national news. Artistically there have been a few high points — Blackest Night, Star Trek, Up, and 7th Son: Descent come to mind. Despite a couple of lousy weeks here at the end of the year, my Saints have had the best season in franchise history. And personally, Erin is wonderful, I’ve finished all my classwork to finish my teaching certification, and I’ve launched a new podcast that I hope you’re enjoying. And I’ve got a couple of other, unannounced projects in the works. While both of them have made progress during the year, that progress has been incremental. 2010? I’m hoping for much more progress on those projects. I’m hoping that other, new opportunities will present themselves. I’m hoping that things improve for this country, but it’ll be a long-fought battle to turn those problems around. But no matter what else is happening or what else is going on, I hope you have a great — SAFE — time tonight wherever you choose to ring in the new year, and I hope that your 2010 is wonderful. Happy New Year, everybody! In honor of Diamond’s decision to essentially shut down the entire comic book industry for this week, I’m going to skip today’s Everything But Imaginary column. Heh — actually, I’m just having too wonderful a time with Erin. Come back next Wednesday when I’ll announce my personal picks for the best in comics for 2009. We’ve had a great visit so far. Yesterday, we intended to go to the Art of Disney exhibit at the New Orleans Museum of Art, but evidently it’s closed on Tuesdays. Did you know that? The nerve of some museums… anyway, we went to the World War II Museum instead. If you’ve never been, you need to go. It’s a remarkable place and an eye-opening experience. The courage, the steel, the resolve America had in the 40s… it’s humbling. And kind of sad, because I don’t see much of that today. Tonight we’re going to do something else Erin has wanted to do for a while — take in a Hornets game. Sure, they haven’t been great this season, but that doesn’t mean going to the game still can’t be fun. It’s been 12 years since James Cameron last made a movie. After Titanic, I think he realized it would be impossible to top himself. Waiting until the furor died down was probably a good thing. But the film he’s returned with, Avatar, is closer to his older science fiction credits like Terminator or Aliens, at least in genre and audience expectations. At the same time, he’s attempting to put forth a more emotional story, like Titanic. The resulting film is very pretty to look at, but the story is such a muddled, overbearing mess it makes it almost impossible to recommend. Set about 150 years in the future, the human race has found another planet — dubbed “Pandora” — with a sentient race of ten-foot-tall blue natives called the Na’vi. Sam Worthington plays a marine who has been paralyzed in the line of duty. His twin brother was part of the “Avatar” program, which allowed them to inhabit cloned bodies mingling human and Na’vi DNA in an attempt to gain the trust of the otherworldly creatures. Each Avatar is genetically coded to a single person, but Worthington’s character (being a twin) can use his brother’s Avatar. 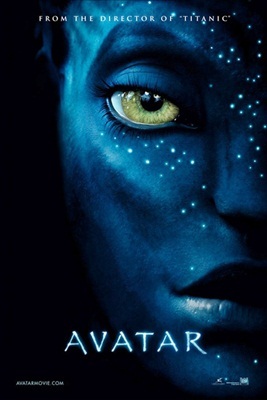 On Pandora, Worthington learns that the military and corporate presence on Pandora is hoping to drive a Na’vi settlement away from its homeland to reach rich stores of a mineral called Unobtanium, and he uses the Avatar to begin to seek a way to negotiate their departure before violence becomes necessary. Much of the criticism I’ve heard of this film is that it’s a thinly veiled anti-United States allegory, with the humans as the Evil White Settlers, the nature-loving Na’vi as the native Americans, and the Unobtanium (unequivocally the worst name for a fictional element I’ve ever heard) as their oil substitute. I disagree. I don’t think the allegory is veiled at all. Hell, I think Cameron could take lessons in subtlety from Kanye West. The first and biggest problem with the film is that it beats you over the head with the allegory for practically the entire running time. Humans (except for the scientists and one Marine) are uniformly evil. The Na’vi (except for one tribal leader who doesn’t trust Worthington, but comes around later) are uniformly angelic and good. Nature is power, technology is baaaaad. It’s so overdone that it saps the excitement. The script doesn’t help either, with heavy, overwritten lines from almost the first scene (where Worthington bemoans the fact that his brother was murdered by someone who wanted “the paper in his wallet”). Matt Gerald, as the Corporal in charge of the operation, is a walking stereotype, firing off terrible one-liners and chewing scenery like a goat going through a tin can. Speaking of the connection to nature, a lot of the stuff in that regard reminded me of elements from Orson Scott Card‘s classic novel Speaker For the Dead. I’m not saying Cameron ripped Card off — I know full well how often different writers can come up with similar ideas. I’m just saying that when Card came up with his ideas, he got a much better story out of it. Then there’s the one saving grace of the movie — the visuals. The visuals are very pretty. The colors are bright and vibrant, the action scenes (if you can make the total avoidance of logic many of those scenes require) are strong. But are the effects groundbreaking, as many of the movie’s proponents claim? Absolutely not. Sure, they look good, but they don’t look any better than other recent effects-driven films like Lord of the Rings or even TransFormers. It’s not the worst movie of the year, but it isn’t one I enjoyed. If you want a movie that deals with some of the same issues in an intelligent, entertaining fashion, go rent District 9. Avatar just wasn’t worth the three hours I gave it. Your good buddy Chase is back for the first of two very special episodes! This week, Chase and Blake announce the winners of the Best of 2009 as voted on by you, the Showcase listener! Then, as this extra-length episode continues, the guys delve into all the big comic book news of 2009. Disney buys Marvel! DC Entertainment! Archie marries Veronica… kinda! And Diamond‘s new rules change the game entirely. If it’s happening in the world of comics, the boys talk about it. In the picks this week, Chase loves The Complete Rocketeer, and Blake gives us The Tick New Series #1! Contact us with comments, suggestions, or anything else at Showcase@comixtreme.com! Music provided by the Podshow Podsafe Music Network. Here in New Orleans, it’s getting a bit chillier. The next week is supposed to be a bit colder than last week, and that’s fine with me. Christmas and New Year never feel right when it’s hot. Erin is winging her way to the Big Easy today. As I write this she’s sitting in Chicago’s O’Hare airport, waiting for a plane that functions properly, because evidently the one she was originally supposed to take did not. She’s not happy, but I intend to take care of that when she gets here. She’ll be here until January 3, and we intend to run around and do all kinds of things before she has to go home. That said, I probably won’t be posting quite as much while she’s here. Hope you guys can live with that. And those of you waiting for more Blackest Night reviews, fear not, I’m not going to stop that. The last couple of weeks have just kept me a bit too busy to get to them all. But I’m going to catch up on all of ’em, don’t worry. Hey, everyone — special offer. Just for today, no shilling, no opining, no flagrant plugs. Just a quick, simple, and heartfelt Merry Christmas! Go be with special people and have a great day.